The small chapel to the east of St George’s Chapel, currently the Albert Memorial Chapel, has been referred to by a number of different names over the centuries, one being ‘Wolsey’s Chapel’, as shown on the nineteenth century plan above [SGC P110/83/1]. Standing on the site originally occupied by Henry III’s thirteenth century chapel, which was subsequently transformed into the spiritual home of the Order of the Garter by Edward III in the fourteenth century, the building changed its purpose after the construction of the present St George’s Chapel by Edward IV. It was almost entirely demolished and rebuilt in the reign of Henry VII as a lady chapel and as his intended place of burial. However, when Henry VII changed his mind and decided to be buried at Westminster Abbey, the partly refurbished chapel at Windsor awaited completion. At this stage it was known as ‘The Lady Chapel’. Subsequent names included ‘Wolsey’s Chapel’ or ‘The Wolsey Chapel’ and ‘Henry VIII’s Chapel’ or ‘The Tomb House’ until, between 1863 and 1873, it was finally converted into its present form on the instructions of Queen Victoria as a memorial chapel to her beloved husband, Prince Albert, after his premature death in 1861. But why had the chapel been associated with the great Tudor churchman and statesman Cardinal Wolsey? It has been widely asserted that the Lady Chapel at Windsor was granted to Thomas Wolsey as his place of burial by his master, Henry VIII, sometime between 1514 and 1524. Wolsey had served as a Canon of Windsor from 1511 to 1514 and William St John Hope, in volume two of his great architectural work on Windsor Castle, concluded that ‘the lady chapel at Windsor must have been granted or handed over to Wulcy, now archbishop of York and a cardinal, and in it was set up a most sumptuous monument for him’. In making this assumption, St John Hope was relying on the research of his friend and fellow historian, Alfred Higgins, who in 1894 had published a paper ‘On the work of Florentine sculptors in England in the early part of the sixteenth century with special reference to the tombs of Cardinal Wolsey and King Henry VIII’. However, Higgins’ own assertion that Wolsey’s tomb was being built in Windsor was apparently not based on documentary evidence and has since been discredited by historians such as Phillip Lindley. Certainly Wolsey was having a tomb constructed by Benedetto da Rovezzano in the 1520s but there is no record that it was intended for Windsor, nor being built there. It was almost certainly being constructed in sculpture workshops in Westminster and may have been intended for York, Ipswich, Oxford or indeed elsewhere. On Wolsey’s fall in 1529, the marble base, pillars and statues of his intended tomb were appropriated by King Henry VIII, who lost no time in having it redesigned as his own funerary monument. In the 1530s a series of payments were made to Benedetto da Rovezzano and Giovanni de Maiano for work on the King’s tomb, specified in 1536 as being ‘at Westminster’ (LP Henry VIII vol. XI no. 516 quoted by Alfred Higgins). There is no doubt that Henry VIII intended to be buried in Windsor, indeed this was specified in his will, but it seems likely that his partially completed tomb was not transported to St George’s Chapel until the reign of his daughter Elizabeth. In 1567 The Lord Treasurer, the Marquis of Winchester, sent plans of the King’s tomb to Sir William Cecil, declaring in a covering letter the intention that ‘the tomb shall be brought to Windsor’ (TNA SP12/43 f.73). A subsequent report to the Lord Treasurer by an unnamed individual, probably a mason, who had inspected the tomb ‘at Wyndsor’ is not dated (BM Lansdowne Ms. 116-13). In the early seventeenth century, there are several references in the Chapter records to the small chapel adjoining St George’s Chapel as ‘The Tomb House of King Henry ye 8th’, but why and when did it acquire its name ‘Wolsey’s Chapel’, particularly if the Cardinal had no intention of being buried there? Adjoining the East End of this Chapel is a fair edifice of freestone raised by the most munificent Cardinal Wolsey, called the Tomb House, from a stately Tomb which the Cardinal designed, some say for himself, other with more truth, for his master, King Henry VIII. Although Joseph Pote in The History and Antiquities of Windsor Castle (1749), challenged the view that Wolsey had had the chapel built, he perpetuated the idea that Henry VIII had granted it to Wolsey in which construct a tomb for himself; a tomb that was subsequently taken over by the King. A plan of 1748 published in Pote’s book refers to it simply as the ‘Tomb House’. The first documentary evidence so far discovered in the St George’s Chapel Archives for the name ‘the Wolsey Chapel’ occurs in a Chapter bill of March 1843 (SGC XIV/1843/13). The small chapel was to be fitted out as a temporary chapel for divine service for a few months during Thomas Willement’s refurbishment of the Quire of St George’s Chapel, and Thomas Adams, carpenter, submitted estimates for ‘fitting out of the Wolsey Chapel’. 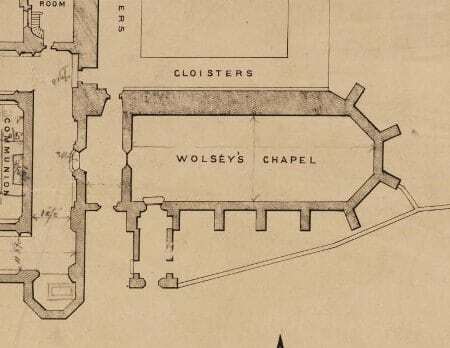 A number of nineteenth century plans, including the one featured above (sadly undated), refer to ‘The Wolsey Chapel’ or ‘Wolsey’s Chapel’. Two explanations may be offered for this: that the name reflected the fact the tomb occupying the chapel had been commissioned originally by Wolsey rather than Henry VIII or, alternatively, that Ashmole’s assumptions that Wolsey had had the chapel built had come to be taken as fact. The traditional explanation, that Wolsey had in fact been granted the chapel as his place of burial, must remain in doubt, at least until further evidence emerges.